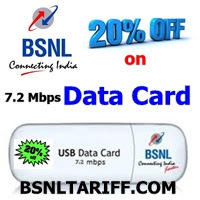 Most Trusted Telecom Brand Bharat Sanchar Nigam Limited (BSNL) has announced 20 per cent discount price on 3G Data cards across Haryana Telecom Circle. The BSNL Haryana Telecom Circle Competent Authority has slashed 3G Data card prices upto 20 per cent for limited period under promotional basis. The 20% discount will be available on 3G 3.6Mbps Data card and 7.2Mbps USB type Data card across Haryana Telecom Circle. The BSNL Customers of Haryana can get their 3G USB type Dongle Data Card under reduced rates. The above scheme will be implemented and offer closed on 23-07-2013.